That news outfits are mere conveyors of unbiased information is a conceit almost no one entertains, particularly with regard to developments in Washington. But still, it’s rare to see such an orchestrated endorsement of a president’s message from a network other than Fox News. 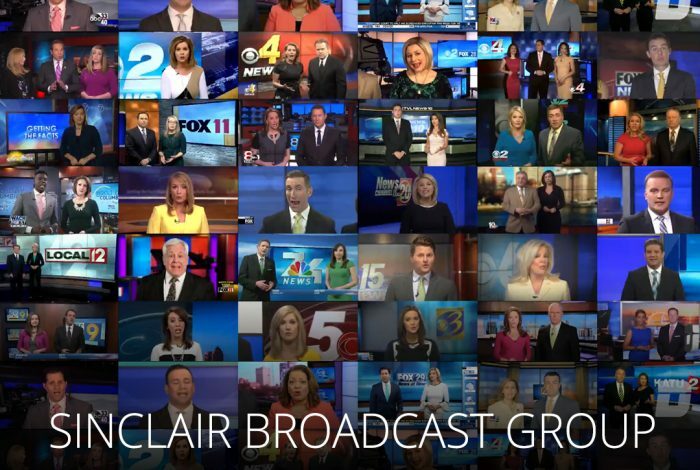 The Sinclair Broadcast Group, the owner of 193 television stations, has managed to operate in relative anonymity until last Saturday, when a 90-second clip revealed that news anchors were told to recite a series of scripted promos lambasting what they considered the biased, fake news-touting liberal media. Deadspin posted the now-viral supercut of anchors robotically delivering the same lines, spliced or layered atop one another to form a chilling chorus of right-wing propaganda. This isn’t the first time the company has injected general conservative dogmas into local broadcasts. In 2004, Sinclair’s Washington bureau chief said he was fired for decrying a program critical of Democratic presidential candidate John Kerry. But Sinclair’s leadership is impenitent. “Do you understand that as a practical matter every word that comes out of the mouths of network news people is scripted and approved by someone?” chairman David Smith wrote to the New York Times, defending the concept of mandated content without addressing its substance. And its grip on cable news may soon grow tighter. Last May, the company struck a $3.9 billion partnership with Tribune Media. Should regulators approve it, the transaction will bring Sinclair-mandated programs to seven of 10 American homes. The deal was all but sealed when the FCC voted in October to repeal a 42-year-old ban on mergers between newspapers and TV stations. Watch the videos below to see how the company manipulates reporting on local stations across the country. Related front page panorama photo credit: Adapted by WhoWhatWhy from Donald Trump (US Coast Guard).